It is amazing how our thoughts can influence how we feel and interact each day! Whether we notice or not, we all tend to have small talk in our heads that guide us in how we feel and react throughout the day. You might not be sure what type of energy you are creating for yourself and others if you aren’t aware of how your thoughts work. Try and see if you can figure out how your mind works one day by focusing on what your mood is every couple of hours; Are you tired? Are you stressed? Are you happy and smiling a lot? Are you full of energy? At the end of the day, check in with yourself and try to figure out why you felt the way you did. Are you tired because you didn’t get enough sleep, or are you tired because others around you are tired? Or are you tired because you anticipated being tired because you had to skip your morning cup of coffee? You could be tired because you honestly had a late night or you could be tired because you think you are tired! Yes, food and exercise influence sleep and energy levels, but your thought patterns can influence your energy as well. Have you ever noticed when people around you are exhausted, it can be challenging to not become tired yourself?! This might mean that you are picking up the energy that they are giving. A way to avoid feeling influences from others is to have your own positive self talk/attitude. By changing your own small talk in your mind, you can help create your attitude and energy that you want to portray. Whatever you think about will eventually be what you feel, so if you are thinking of being happy and making yourself smile, you most likely will start to feel the same way! This is similar to The Law of Attraction described and written by Esther Hicks (a great book!). The book does a great job in explaining how desires can be obtained by thoughts and how unwanted thoughts can also lead to unwanted events. Taking this information, we can all learn how to change our thought processes to obtain our desires of being full of energy, happy, success, love, and more. 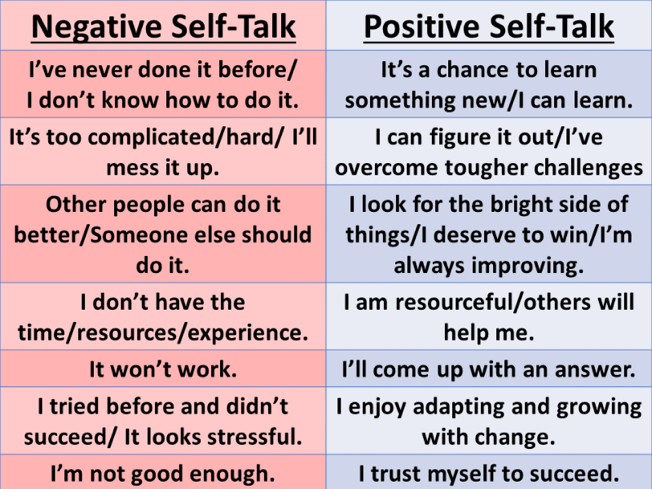 Positive self talk can be as simple as saying to yourself, “I am going to have an amazing day!” every morning, or instead of thinking of how tired you are, think of the energy that you do have and try to encourage your thoughts to heighten that energy. 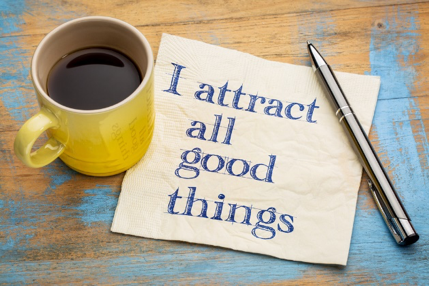 Your main focus should be on the positives, not the negatives…this way, you can improve your thoughts which will influence your attitude towards others and in return will significantly improve your overall energy! Not only will this help improve your overall experience each day, but it will help others around you! The energy that you put out there will eventually come right back to you; so if you are kind and happy to others, people will reciprocate this energy and they might not even know it’s because you are putting that energy out there first! All of this information can help us obtain a healthier lifestyle. 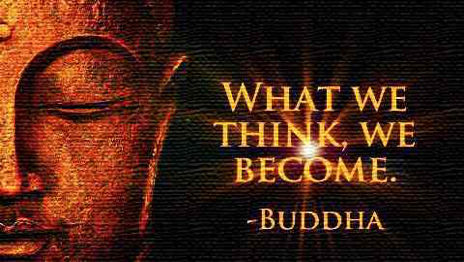 Our thoughts can help us change our attitude greatly! For example, one morning you might wake up and it’s a rainy day and the first thing that comes to mind might be, “Oh great, another rainy day…” but, have you ever thought, “Oh great, another rainy day to help my garden grow beautiful flowers and delicious zucchinis!”? A different thought can change your overall attitude! Without the rainy days, we would not appreciate the sunny days! Using this example, you can see how a positive thought process can lead to a better life, but how can it make us healthier? Health is not just what you eat or if you exercise, but it is also your mentality; your mindset can improve your health through positive thoughts! Did you know that thinking happy thoughts can increase serotonin levels (a hormone that regulates mood)? Your thoughts cause neurochemical changes that can alter your hormones, your brain, and more! Dopamine, endorphins, and oxytocin are other hormones that are associated with our happiness and with more balanced hormones, we can all have a healthier mind, body, and spirit. On the other hand, negative emotions can impact cortisol levels, which can slow down your metabolism. This makes it hard to lose weight or maintain weight. The good thing is that positive thoughts can release hormones that can decrease your appetite and help you lose weight and stay focused on your goals! Being in the weight loss industry, I have seen many people with a “black and white” mindset; meaning, you are either on a diet or off a diet, you are either good or bad, healthy or not healthy… but this does not have to be the case. This dichotomous thinking can hinder our success when attempting to lose weight because there are always grey areas. Maybe you did go out to a party and have pizza, but did you eat the whole pizza? There are going to be times when you will treat yourself to meals and it doesn’t mean you must overstuff yourself by eating an entire pizza, but maybe have 1-2 slices and enjoy every bite by savoring the flavors! Have a nice big salad with it as well to get some vibrant veggies with your meal and know that yes, you did have some great yummy food that may not be “diet” approved, but, you still did much better than engorging yourself with the whole pizza! This is the type of positivity that will help you through your weight loss journey and through life in general. If you were to focus on how you completely ruined your diet by eating pizza, you might find yourself in a negative mindset and continue in that downward spiral of making poor choices. Try to get yourself as far away as possible from this situation, try to recognize that it might happen, and then just reflect on it and move on. Re-pattern that thought process by overriding what you would normally think by saying, “I had some tasty pizza and I enjoyed it and I’m proud of myself for not overstuffing myself. I am going to move on from this and continue to eat healthy foods after I treated myself with pizza”. There is no need to think that you have failed or gone off your diet, you have simply eaten food that you enjoy and you have now moved on to healthier choices after!